To begin we need to understand what Cricket Strategy and Tactics are and how we can use them. As we learn these skills and understand them we can not only use them to begin to play ‘Winning Cricket’ more frequently. We can begin to understand, for example, what Gary Kirsten as India’s Coach and M.S.Dhoni as Captain are seeking to make happen on the field during a game. How are they applying cricket strategy and tactics, whether it be in a Test Match, ODI or a 20 20 cricket game. Strategy in its application in cricket, is the overarching plan to bring victory. It begins with the planning and preparation stage and follows with the active engagement with your opponent in a match situation. Your cricket strategy is broken down into a sequence of steps, which like our man on the staircase here, are most typically followed in a logical form. One step usually follows the other, although not always, they can be free form, but more of that later. A simple analogy is to think of a journey from A to E, if you can imagine flying above the journey you will be able to to see the steps from A to B to C and so on to E, you need to go through B to get to C, from C to D, D to E. The steps lead up to E, which is the culmination of the strategy and brings victory with it. Cricket as we know isn’t always logical, nor linear, in the planning stage we can break down our cricket strategy into a simple structure which has logical steps, this gives us a template from which to choose options during the game. There are Three Key Areas to Cricket Strategy, there is Individual ‘Player Strategy’, then there is the strategy for a ‘Sub Team’, for example the bowling or batting unit within the team, then there is the overall ‘Team Strategy’. Tactics are the use of different ‘weapons’ or units within the team and we can see they operate on different levels,the ‘Players strategy’ fits into the ‘Sub Team strategy’ and the ‘Sub Team Strategy’ fits into the ‘Team Strategy’. The players tactic may be to use a ‘weapon’ they have in their armoury. The weapon is typically a strength they have, it may be a bouncer, a sweep shot, a googly, a lofted drive, these are used as tactics to execute their own game plan and disrupt their opponents. 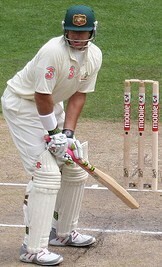 The batsman may choose specific tactics as part of their overall batting strategy; as you can see in this photo of the great Australian batsman Matthew Hayden, he would bat out of his crease on an off stump guard to take the bowlers line and length away. The primary objective of the tactic is to control where the bowler bowled, thus opening up his own scoring options. The bowling units’ tactics maybe to use the short ball against a key batter who they know likes to play front foot strokes. This will force him to play strokes in the weaker parts of his or her game, off the back foot. Another example, the Captain may ask his fast bowlers to bowl a full attacking line and length outside off stump, this tactic is so that he can set a field with the goal to get the batsman caught behind. You can see in this classic photo how the Captain has set his field, although the field setting was orchestrated for the photo, the line of attack is obvious, off stump and outside. Why a Code and how do you Unlock it ? Parts of what I have already discussed may be beyond where you currently are in your understanding of the game, thats fine, be patient, as you grow and study cricket it unfolds and things that were seemingly ‘Greek’ begin to be understandable. If you speak Greek now then great ! The code is understanding the sequence of steps within the strategy, with the ultimate goal to bring Victory. So this may simply be the logical steps I spelt out earlier, or it may be ‘free form’, where the Captain and players use interchangeable tactics dependent on the situation and time during the game. This is typically cricket played at International and First class level, where the level of research into the opposition is deep and far reaching and the skills and their application are world class. Unlocking the Code is learning how the the parts of the jigsaw that make up Cricket Strategy and Tactics fit together. As your knowledge grows your appreciation and enjoyment deepen, you begin to read the ebb and flow of the game and understand what Captains like Ricky Ponting and Graeme Smith are seeking to do with their bowling attack, or why they are placing their fielders in specific postions. I am going to keep the discussion around cricket strategy and tactics as simple as possible for two reasons. Firstly, because when it is simple it is closer to being accurate, efficient and effective. As Einstein said, ‘Everything should be as simple as it is, but not simpler’. Secondly, the goal here is an introduction to Cricket Strategy and Tactics, it isn’t meant to bamboozle you like a Shane Warne Googly. The biggest cricket lesson in the world.